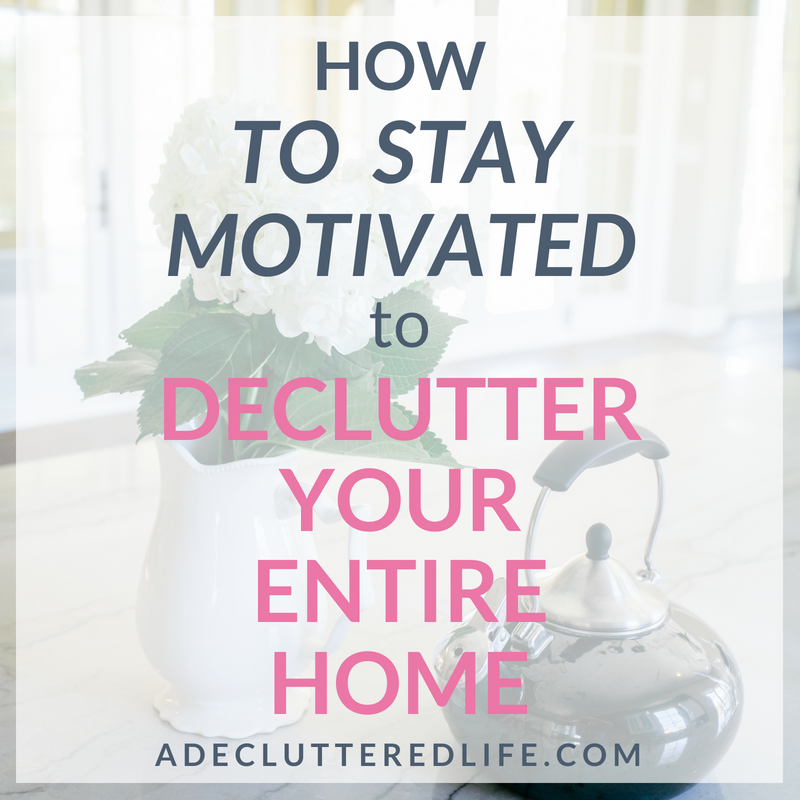 Decluttering your house requires a lot of motivation to keep going! These easy tips will help you stay motivated as you declutter your entire home. 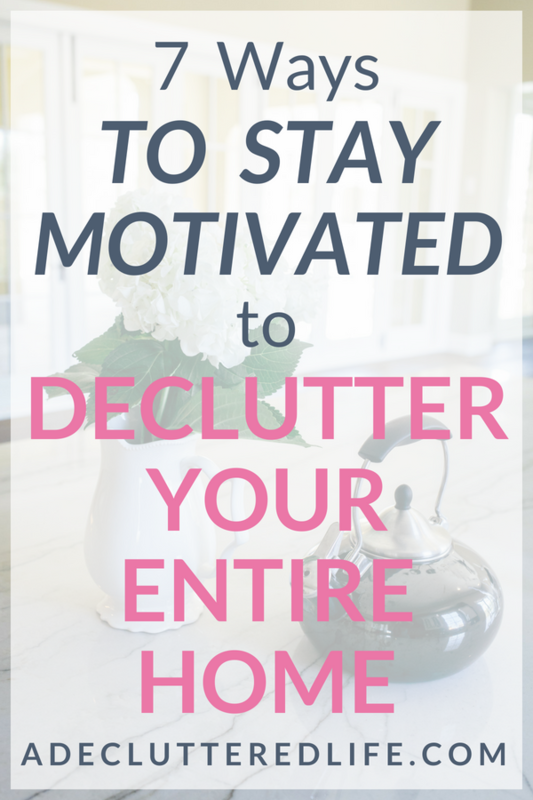 Need help staying motivated to declutter your home? These 7 practical tips will help keep you motivated when decluttering! When your home is full to the brim with “stuff”, you know that it will take significant time and effort to get it decluttered. You start out strong and do a great job of decluttering a few areas. But then you look around and realize you still have SO MUCH left to declutter. This can be demoralizing and can bring your decluttering efforts to a stand-still. Don’t let this happen to you! You will have to stay motivated over the long term to really get your home decluttered. Need some daily encouragement to help you stay motivated to declutter your entire home? Click here to sign up for my free Decluttering Challenge. You’ll learn the 7 tips that allow you make progress quickly PLUS an easy-to-stick-to decluttering method that makes decluttering do-able for anyone, even if you’ve struggled for YEARS or have a TON of decluttering to do! Click here to sign up. 1. Motivate yourself to declutter with a time-based goal. 2. Motivate yourself by planning an event at your home for family or friends. Start a fun Pinterest board and pin party ideas for your event. When you don’t feel like decluttering, browse your party board to inspire yourself to keep going, so that your home will be in great shape in time for your big event. Follow my decluttering and organizing Pinterest boards for more tips and inspiration! 3. Motivate yourself by envisioning a clutter-free home. Remember the last time you hosted an event/party/get-together at your home and worked so hard to have everything cleaned up? Didn’t you find yourself wishing your home could stay that clean and clutter-free? Well, it can. But it will require on-going effort through good habits and intentional choices. 4. Motivate yourself by making decluttering a part of your daily routine. If you already practice a morning or evening routine, add 5 or 10 minutes of daily decluttering to your schedule. You (and your family) are continually bringing more and more items into your home. When you don’t declutter just as often, you can’t possibly keep up. Join my free 5-day Decluttered Life Challenge to create a decluttering habit that works. You’ll learn the easy-to-stick-to method that has helped thousands of women declutter their homes! 5. Motivate yourself with weekly rewards. Set a goal to declutter for 5-10 minutes, every day, M-F, with a fun reward on Friday or Saturday: coffee with a friend, a favorite yummy lunch with dessert, or a couple of hours for a movie or some reading. Plan a big weekend decluttering project, like cleaning out the garage or your most cluttered room, and reward yourself with a date night, some “me time” out of the house alone, or pizza delivery and a family movie for an easy and fun weekend night. 6. Motivate yourself to declutter with small daily rewards. Many years ago I read a parenting book that advised, “don’t give away the ice cream.” Basically, the authors meant that treats should be used as rewards. Whether or not you agree with this, many adults would be well served to apply this concept to their own lives. Give yourself 10, 15, or 20 minutes of a favorite activity (playing a game on your phone, scrolling Facebook or Pinterest, or reading a chapter from a book) ONLY AFTER you’ve spent some time decluttering. Use your favorite activity as a reward for accomplishing things you would otherwise procrastinate on. 7. Motivate yourself with a big decluttering goal. Think about how decluttering your home will make you feel and about how much you would enjoy achieving your big goal! Click here for more tips on staying motivated to declutter your home. Remember these three important things. Staying motivated when decluttering is hard, especially when you have years’ worth of household items to declutter. Your home did not become cluttered overnight and you will not be able to get it DE-cluttered overnight. It will take consistent, sustained effort to significantly declutter your home. Set a 5-10 minute timer right now. Step away from your computer and put down your phone. Choose one cluttered spot in your home that is driving you crazy: your dining room table, your entryway, your kitchen counters, etc. Work until the timer goes off. You’ll be really surprised by how much you can accomplish in a short period of time! Just get started. That’s always the biggest challenge. Set your timer and get started right away! Make room for the good life. Ready to declutter your home? Join the free 5-day Decluttered Life Challenge. I’ll help you finally create the clutter-free home you’ve wanted for so long, with an easy-to-stick-to decluttering method that even the busiest mom can follow!